As many of you mommies know, washing those dishes every night, using cleaning products, or doing every day activities around the house can REALLY take a toll on your hands. I personally get dry hands and some flakiness in between my fingers and was DESPERATE to find a hand cream that actually works, and well ladies I'm happy to report that my search is over! Vaseline's healing hand cream really does a great job of moisturizing my hands all day. Some hand lotions you put on and think they work great and 20 mins later your back to having rough, dry hands. Well, that's not the case here! Besides not needing to reapply constantly, the formula leaves your hands feeling moisturized without feeling greasy. A little dab is all you need and your own your way to having baby soft hands. 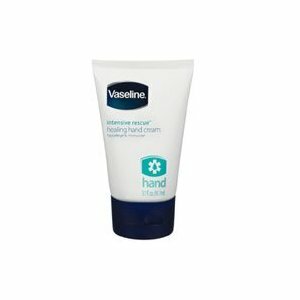 Vaseline's healing hand cream is hypoallergenic and unfragranced so no worries for you ladies that have sensitive needs. It retail's for around $3-$4 depending on where you buy it. It's 3.1 fl oz which is small but since you only need a little dab each time it works out. Have you used it? Will you try it? Let me know! I like the Vaseline products and they have great stuff for kids. You are right; it is the best hand cream out there, even works on eczema. However, you may want to work on your spelling. Example: "A little dab is all you need and your own your way to having baby soft hands." I think you mean "and you're on your way". You're means 'you are'. And there is no apostrophe in retails.